3D printing offers a lot of great options for students. It’s a great way to teach design and technology, especially if you want to explain how computer design translates into the real world. As 3D printing becomes more and more common, experience with these 3D printing projects will be something up and coming students will be happy to have. Besides, these projects are a lot of fun and the students get to take home their brand new project! Here are some of the best 3D printing ideas for students that they are sure to enjoy AND learn from. Whether your students use their tablets to read or to play games, it can be hard to hold it while eating or just sitting comfortably without getting a crick in their necks. Tablet stands are easily found in many stores in a wide range of designs, but why not give students the ability to make and design their own? There are plenty of designs online to base their own off of. This is a small, simple project, which will be useful for students of all ages, or even can be given as a gift if they don’t have a tablet of their own. 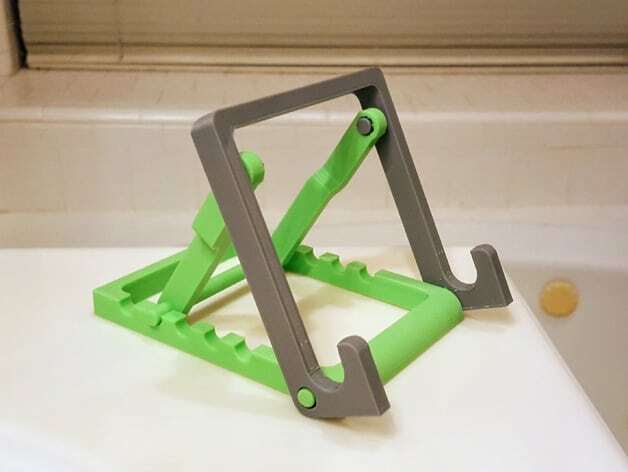 Phone stands are a variant of the same thing, often differing only in scale, and are another nice 3D printing student project to consider for your class. Not everything that is 3D printed has to be practical. There are many, many great designs for 3D jewelry on the web and a quick glance through can open up a designers’ mind to all the new possibilities this tech offers. This is also a great way to get the attention of students who aren’t going to find the idea of 3D printing very interesting right away. Ask any kid how often they lost their earbuds or accidentally break them when they wrap them around their phone. With the increased popularity of wireless headphones, this is becoming an even more common problem. Help your students solve this problem by designing and 3D printing an earbud holder for on the go or an earbud stand for home. There are simple versions and complex versions of earbud holders out there as well as a vast number of ways to design earbud stands. If you’ve got some gamers in your class, they can even 3D print a pretty cool stand for their gaming headphones! Every student wants to be unique and their phones are one way they express that. They probably know someone out there who has the exact same phone case as they do and none of them like it. Give them an opportunity to make a truly unique phone case through 3D printing. It’s a relatively simple project with a lot of room for creativity. It should appeal to all your students, too, which is an added bonus! Many of these items are extremely useful in your day to day life. At Jawstec, we view 3D printing as a large part of our future. We are happy to help the next generation of entrepreneurs, scientists, engineers, teachers, and designers learn more about the sky-high possibilities of 3D printing. Contact us today to see if we can help you and your students with some of these great 3D printing student projects!